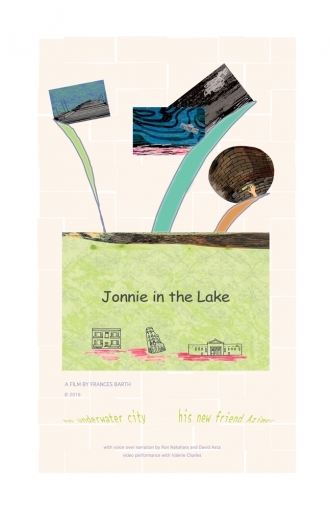 The animation "Jonnie in the Lake"
A magical experience for 9 year old Jonnie who travels to an underwater city and meets his new friend Azimer, a former downtown performance artist. This animation is hand drawn and based on an original script by Frances Barth, with voice over by Ron Nakahara, David Asta and Frances Barth, and includes rotoscoped video performance by Valerie Charles. "End of the Day, End of the Day"
The original animation/video with voice over dialogue is set just after 9/11 and involves a two day evening commute of a husband and wife. The passenger side car views show the NJ waterfront.The animation is hand drawn, with a digitally animated section that accompanies the opening monologue. The artist's intention was to combine aspects of traditional animation and the graphic novel. animation/video by Frances Barth re-mastered 2018 for live reading.